Researchers at the Massachusetts Institute of Technology (MIT) have pioneered an innovative new method of mass-producing cell-sized robots called “syncells”, which could be used to search out diseases in our blood stream or monitor conditions within an oil or gas pipeline. Process Industry Forum takes a much closer look at this giant breakthrough for microscopic sensors. The key to making tiny devices in large quantities lies in a method MIT’s team of researchers developed for controlling the natural fracturing process of atomically-thin, brittle materials, directing the fracture lines so that they produce miniscule pockets of a predictable size and shape. Embedded inside these pockets are electronic circuits and materials that can collect, record, and output data. The novel process, called “autoperforation,” is described in a paper published in the journal Nature Materials, by MIT Professor Michael Strano, postdoc Pingwei Liu, graduate student Albert Liu, and eight others at MIT. The system uses a two-dimensional form of carbon, called graphene, which forms the outer structure of the tiny syncells. One layer of the material is laid down on a surface, then tiny dots of a polymer material, containing the electronics for the devices, are deposited by a sophisticated laboratory version of an inkjet printer. Then, a second layer of graphene is laid on top. People think of graphene, an ultrathin but extremely strong material, as being “floppy,” but it is actually brittle, Strano explains. But rather than considering that brittleness a problem, the team discovered that it could be used to their advantage. 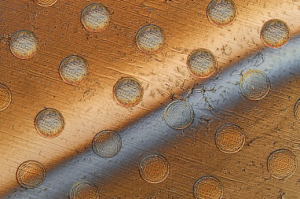 This photo shows circles on a graphene sheet where the sheet is draped over an array of round posts, creating stresses that will cause these discs to separate from the sheet. The grey bar across the sheet is liquid being used to lift the discs from the surface. Ranging in size from that of a human red blood cell, about 10 micrometres across, up to about 10 times that size, these tiny objects “start to look and behave like a living biological cell. In fact, under a microscope, you could probably convince most people that it is a cell,” Strano says. For more information visit www.mit.edu. Founded to accelerate the nation’s industrial revolution, MIT is profoundly American. With ingenuity and drive, our graduates have invented fundamental technologies, launched new industries, and created millions of American jobs. At the same time, and without the slightest sense of contradiction, MIT is profoundly global (opens in new window). Our community gains tremendous strength as a magnet for talent from around the world. Through teaching, research, and innovation, MIT’s exceptional community pursues its mission of service to the nation and the world.